1)Ryan McDonagh is either quietly predatory (which I highly doubt) or just plain oblivious to the game around him and it seems to have rubbed off on his fans. I’m going with option B and it all stems from the Simmonds sucker punch incident last season. Simmonds went to lay a clean hit on him and McDonagh cross checked him clean in the head. Even though Simmonds came over to have a chat with him about it he kept his hands down by his side like he was in a bubble and seemed genuinely surprised and confused when he got clocked. A confirmed concussion and a couple of scares later, he then dangerously tagged Conor Sheary as a board advertisement. 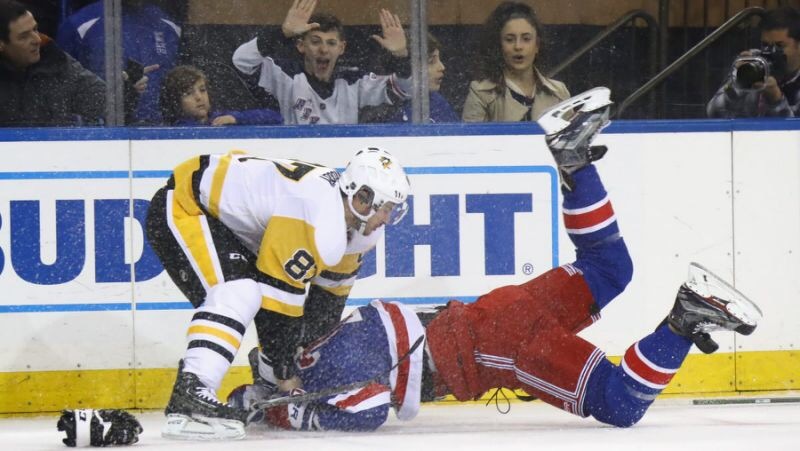 Yet for some reason, all Rangers supporters can talk about is how if McDonagh got 5 minutes for boarding, why can Crosby drop the mitts, pummel him to near death and only get two minutes? For the definition of Boarding I’ll refer you to page 67 of this document, the NHL Rulebook. Of course, he could have gotten a cross checking penalty instead but here’s the oblivious thing coming into play. First of all, he has a personal history of injury from dangerous hits. Even if that doesn’t matter, there’s been at least three similar hits under scrutiny in the past week or so alone (Dekeyser on Wilson, Dumoulin on Foligno, and Emelin on JVR. I cover them all here). Maybe you might want to not put yourself under that microscope? Ok, the blame is on NHL Player Safety a little for not doing anything meaningful about those hits, but the officials made things pretty clear. Emelin and Dumoulin both got two minutes for cross checking. Dekeyser got a 5 minute major for boarding. The important difference? Emelin and Dumo both used their sticks at waist level allowing the opponent to keep his head up when hitting the boards. Dekeyser hit up in the numbers/shoulder blades, forcing the head and neck down and leading into the boards. I’ll give you one guess what McDonagh did. The 5 was easily avoidable. The 5 precedent was recently set by NHL officials. He should have expected the 5. He got the 5. He deserved the 5. 2)The bias people think the NHL has for Sidney Crosby as the Golden Boy has gone from a half-hearted bubbling to volcanic eruption, and it’s completely baseless. Remember, the second part of the question is how did Crosby only get 2 minutes for fighting?? I’m going to ask anyone to watch the video above and send me the freeze frames or GIFs or whatever you can find of Crosby actually throwing punches. That would be swell. Plus, even one or two token punches wouldn’t be considered a fight. Instead of being upset that it was Sidney Crosby and accusing the league of inaction, how about thanking your lucky stars it was Sidney Crosby and not someone who doesn’t respect concussions. McDonagh – concussion plus scares, makes reckless decision to hit when he shouldn’t. Crosby – multiple concussions, has an actual offender dead to rights at his mercy, doesn’t lay a hand to his head. That’s what you need to take away from this. Really step back and appreciate this, Rangers fan or not. 3)If the media itself is actually biased it doesn’t help its cause at all. In order to find a video of Sheary being hit by McDonagh I had to search for “Crosby fights McDonagh” or “McDonagh rag dolled by Crosby”. If you don’t want the label, don’t feed the fire.